This is the simplest cookies recipe for first-timers and beginners. I am, one of the first timers in baking cookies, too (laughing)! Yes, this is the result of my first cookies baking. Yes, the cookies taste delicious. I brought them to the office the next day, to share with my colleagues. The feedback was good, and I have impressed them with these chocolate cookies, especially the texture. Shapes are kinda odd (I had square and round shapes from all 4 rounds of baking.. ha..), but taste is perfectly good. It feels so crispy to chew and the level of sweetness is just perfect for everyone. As I said, this is the recipe for beginners. If this is going to be your first baking experience, and not yet got a electric mixer. No worries, use a hand mixer. Unlike baking cake, you do not really need a perfect refine mixture of all ingredients. Hand mixer will be good enough to create a reasonable blend in this case. But of course, more ‘exercise’ for your arm is expected, if you are using the hand mixer here (chuckling). Oh yes, one more thing here, I forget to tell you that I am a kind of cook who seldom follow the exact weight/ amount of ingredients to be used, but to follow my ‘instinct’ in cooking. So, I do not have exact measurement in this recipe. I used a bowl, a regular-sized serving bowl of about 3″ depth and 4.5″ diameter. I called it the medium ‘rice bowl’, for my measurement of plain flour and sugar here. Ok, ok, I will try to find out the actual weight of each ingredients used, if you need it (winking smile). Well, just give it a try, you can impress your loved ones just as simple as 1.2.3. 1) Sift plain flour. Mix baking powder into sieved flour. Set aside. Break or chop chocolate bar into pieces. Place chocolate pieces in a microwave-safe container and microwave at defrost mode or low for 1 minute, or until the chocolate turns shiny paste. Alternatively, melt chocolate pieces with double boiler over hot water. Stir chocolate until smooth texture. Reserve for later. 2) Cream sugar and butter in large mixing bowl, beat well with electric mixer over low speed till fluffy. Add in egg. Gradually mix sieved flour into the mixture until well combined. Blend in vanilla essence and chocolate paste (melted chocolate). Add chocolate chips and mix well, if desired. 3) Grease cookies sheet or waxed paper, and place on the baking tray. Drop mixture by spoonfuls each with 1 inch apart on baking sheet. Preheat oven for 5 minute over 350 degrees F (180 degrees C). Place cookies into oven and bake for 10 – 15 minutes using the same temperature. Allow cookies to cool on baking tray. Serve or transfer into air-tight container to store, when completely cooled. 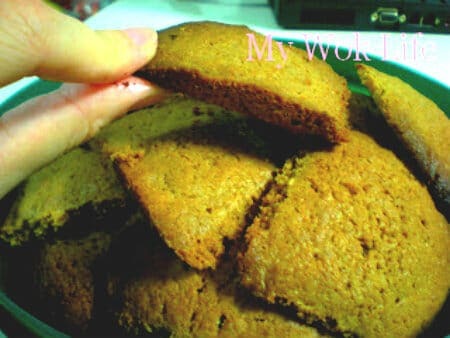 This recipe yields wonderful crispy cookies, and the taste is simply fantastic. It leaves mild fragrance of chocolate taste in the palate. If you do not have chocolate bar, no problem. Use 2 tablespoons of cocoa powder to replace it. Tips: Texture of the cookies mixture is not so much a form of dough. It is likely to be thick batter form (semi-solid dough). A very thick and yet a little liquid kind of consistency, but no worries, the result of your bake with this recipe will be perfectly fine with wonderful crispiness. * However, if use cocoa powder, it is likely to form a dough with the mixture instead of semi-solid dough texture as abovementioned. * Place cookies mixture with about the size of one fifty cents coin on the baking sheet. Do round or square shape, as desired. Remember to leave 1 – 2 inches gap to allow expansion when baked. * Cookies must be stored in air-tight container to retain its crispiness. Can. By hand will do.